AMC Networks is taking its fight against Dish Network on the campaign trail. No longer content to run ads informing viewers the satellite cable provider no longer carries AMC, the network has introduced A. Zombie, an independent candidate who's running for president. His platform: to bring AMC Networks channels AMC, WE tv, IFC and Sundance Channel back to Dish subscribers. The satellite cable provider dropped the AMC Networks' channels on July 1, indicating that the fees associated with a new contract to carry the channels wasn't a good value for subscribers. A source with ties to the situation told The Clicker at the time that despite Dish's claims, there have been no discussions between the two parties about fees. 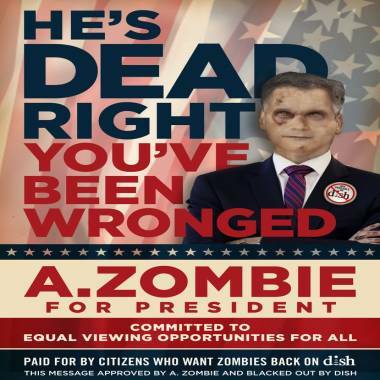 The significance of the first undead presidential candidate ever? Well, besides the fact that he's hoping to make sure all not-exactly-dead creatures can watch the same popular shows, critically acclaimed zombie drama "The Walking Dead" is scheduled to kick off its new season on Oct. 14 on AMC. But for Dish subscribers, unless the satellite cable provider decides to carry AMC Networks again soon, there will be no highly anticipated season three for them. Subscribers have already missed out on the first half of the final season of "Breaking Bad." From what Dish chairman Charlie Ergen has had to say about the dispute between the satellite cable provider and AMC Networks, fans shouldn't hold their breath. During a call with analysts earlier this month, Ergen said that AMC shows such as "Mad Men," "Breaking Bad" and "The Walking Dead" are "not viewed as much by our audience." As for the Dish subscribers who love those shows? "Our customers can go to iTunes," Ergen said. And that's why Mr. Zombie is hitting the road to spread his message of equal viewing rights for all. 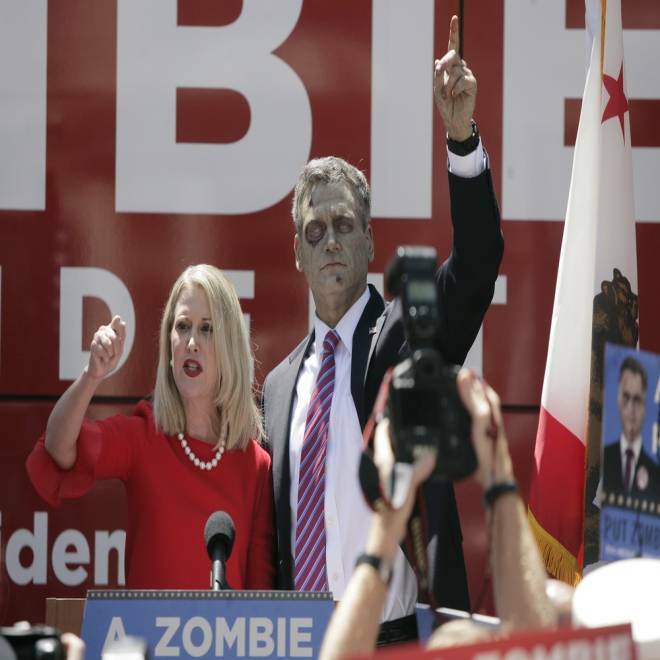 He kicked off his campaign in San Diego on Monday, where zombies showed up to support him and his cause. A. Zombie and his wife, Patty Morgan-Zombie, greet fans and other zombies at a press conference for AMC's "The Walking Dead" at Horton Plaza on Aug. 20 in San Diego. Dish Network has not responded to a request for comment about Zombie's mission. Zombie's next stops will be Dallas on Aug. 24, Atlanta on Sept. 1 and New York on Sept. 5. But that's not all. He'll also be hitting up the Republican and Democratic National Conventions, with stops in Tampa on Aug. 28 and Charlotte, N.C., Sept. 3-4. What do you think of AMC's new campaign? Share your thoughts on our Facebook page. 'True Blood' finale sneak peek: is Sam Merlotte a dead man?